The original Malvern water will be quenching the thirst once again as The Holywell Water Company Ltd gains the right to use the famous township in its branding. The Holywell Water Company is now delighted to announce the subtle yet highly signifcant rebranding of its bottled still and sparkling spring water to Holywell Malvern Spring Water! 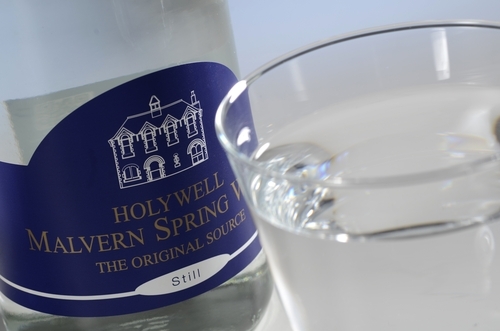 The Holywell Water Company has produced Holywell Spring Water, which is sold in some of the finest hotels, restaurants and castles in the country, since 2009 from the original spring in the heart of the Malvern Hills, Worcestershire, but has been unable to use the word ‘Malvern’ in any branding until now. Water from the original Holywell spring in Malvern was first commercially bottled by Schweppes in 1843 and continued there for 54 years until the company moved production to a different site in 1897. Coca-Cola took over Schweppes and continued to produce Malvern Water from this site until the brand was dropped in 2010. The Holywell Water Company took ownership of the original Malvern spring and 19th century building used by Schweppes in 2009, but despite bottling fresh spring water from this source the company was unable to use the iconic town in its branding. The Holywell Water Company will be showcasing its newly branded bottles for the first time at the Hotelympia trade show at ExCeL, London, from the 26 February - 1 March. The company has also taken this opportunity to include a QR code on its labelling which will take users on a video tour of the Holywell spring. Issued by the HEART of ENGLAND fine foods Press Agency on behalf of The Holywell Water Company Ltd.
HEART of ENGLAND fine foods (HEFF) is the food group for the heart of England region. It was formed in 1998 to promote and raise awareness of local food and drink across Shropshire, Staffordshire, Herefordshire, Worcestershire, Warwickshire and Birmingham and the Black Country. HEFF is based at the Shropshire Food Enterprise Centre, Battlefield Enterprise Park, Shrewsbury. Through an extensive programme, the organisation helps the region’s food and drink businesses to develop and create profitable and sustainable markets for their products. The HEFF Press Agency is just one of a number of services offered by HEART of ENGLAND fine foods to support regional food and drink SMEs. This press release was distributed by ResponseSource Press Release Wire on behalf of Heart of England Fine Foods (HEFF) in the following categories: Health, Environment & Nature, Food & Drink, for more information visit https://pressreleasewire.responsesource.com/about.